Volleyball is a match made up of 3 games. Each game is played with 6 players (3 guys and 3 girls) Teams will play all 3 games in regular season matches regardless of the outcome of the first 2 games. The first 2 games are played to 25 points and the 3rd game to 15 points. Points are scored rally-style. A female player must make one hit on each possession if more than one hit is made. During playoffs, games will be best 2 out of 3 games to determine which team advances. The Spring Novice Monday season will play at St. Peter's Church on Hanover Ave. in Allentown starting March 11th. Games will play on Mondays, and game times will be start at 6:30pm. The bar sponsor for the season is Stahley's Sports Bar. All teams must have at least 6 players on the roster. All team players receive league t-shirts. Subs may play in any given week. Subs do not receive league t-shirts. Subs must play at least 1 week in regular season to be eligible for playoffs. 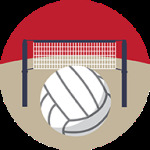 Check out this Volleyball (Indoor) league '19SPR - VOLLEYBALL - INDOOR NOVICE COED (RATIO 3:3) - ST. PETER'S CHURCH (MONDAYS)' with Lehigh Valley Leagues!